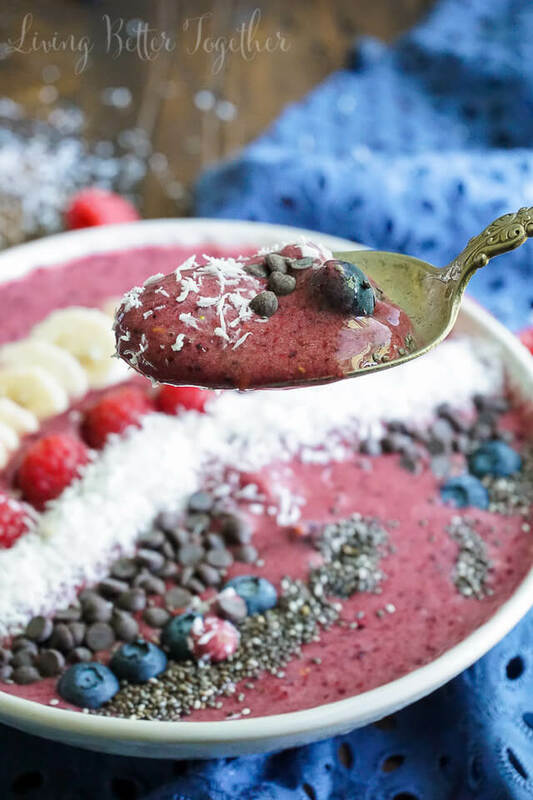 This Vegan Berry Banana Coconut Smoothie Bowl is a gorgeous and delicious way to start your day! Smoothie Bowls. Heard of them? If yes, then you understand my excitement, if no, then I’m excited to be the one to introduce you to them! Smoothie Bowls are an up and coming trend, a trend is a word I’m not supposed to use. Matt and I have always kinda hated the idea of loving or doing something just because everyone else is. 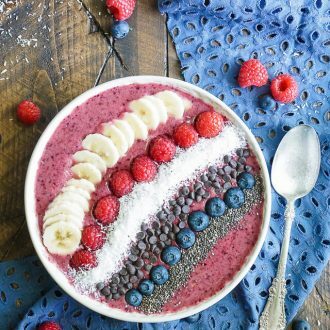 Once something goes mainstream, it kind of loses its appeal, but smoothie bowls are a trend I can totally get behind! 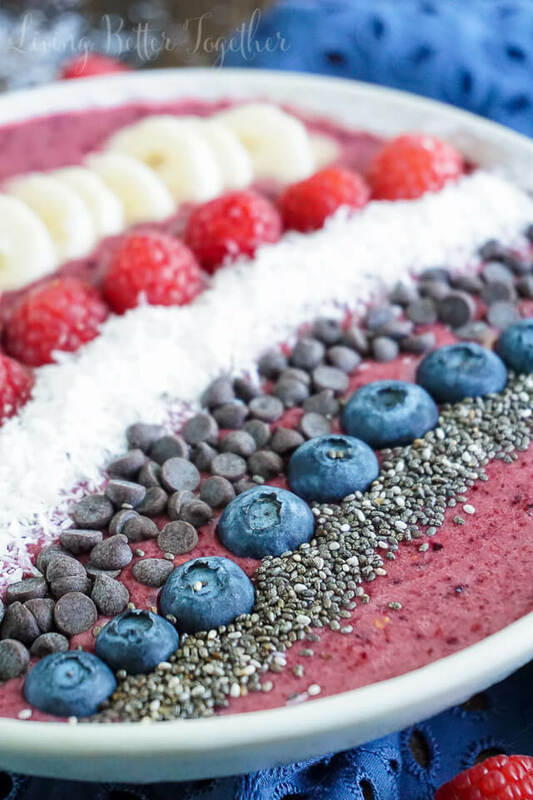 Smoothie bowls are exactly what they sound like, smoothies served in a bowl and usually loaded up with additional nutritional goodies like fruit, chocolate and oats since you don’t have to drink it through a straw. You can dress them up and make them pretty gorgeous too! 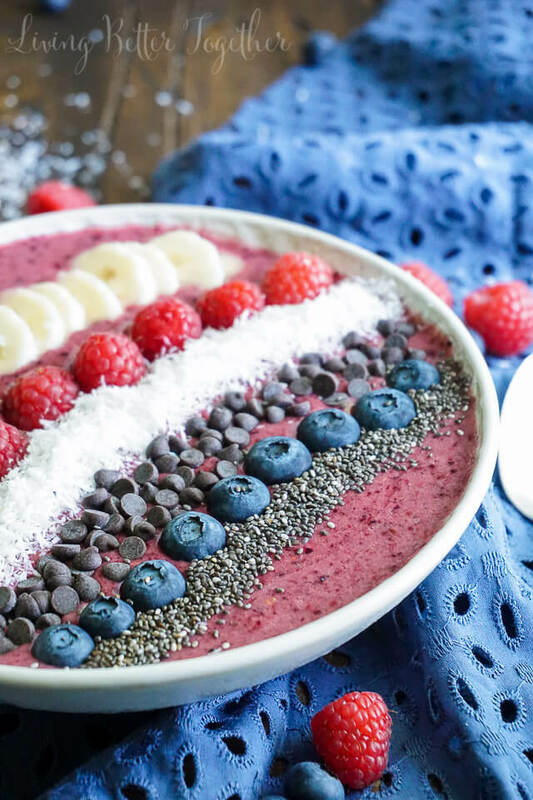 This particular smoothie bowl is both gluten free and vegan, thanks to a coconut milk base. A blend of four different kinds of berries gives it a beautiful color and flavor and a touch of agave gives it a simple sweetness. The banana helps to thicken it up as well as adding potassium to the dish and giving you a good start to your day. Finished off with fresh whole fruit, chia seeds, and mini vegan chocolate chips and you’re well on your way to a delightful breakfast. Oh right, and since you can’t make a smoothie bowl without a blender, some of my friends and I are giving one away! 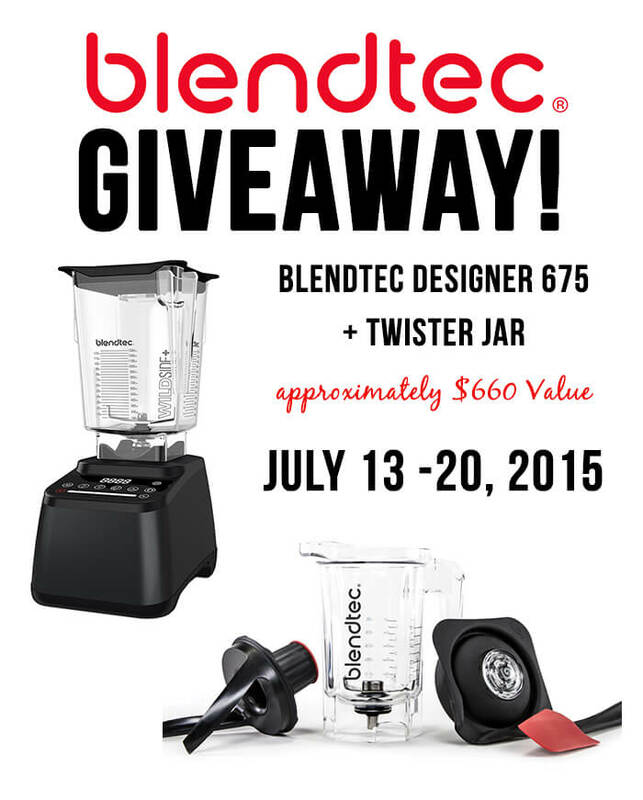 A Blendtec Designer 675 and a Twister Jar valued at more than $600.00 could be yours! Check out how to enter below! Combine smoothie ingredients in a blender and blend until smooth. Pour into two bowls and top with toppings, dividing evenly between the two. Use Vegan mini chocolate chips to keep the dish vegan. Can substitute agave for honey if being vegan isn't a concern. The first thing I’d make is a strawberry smoothie. 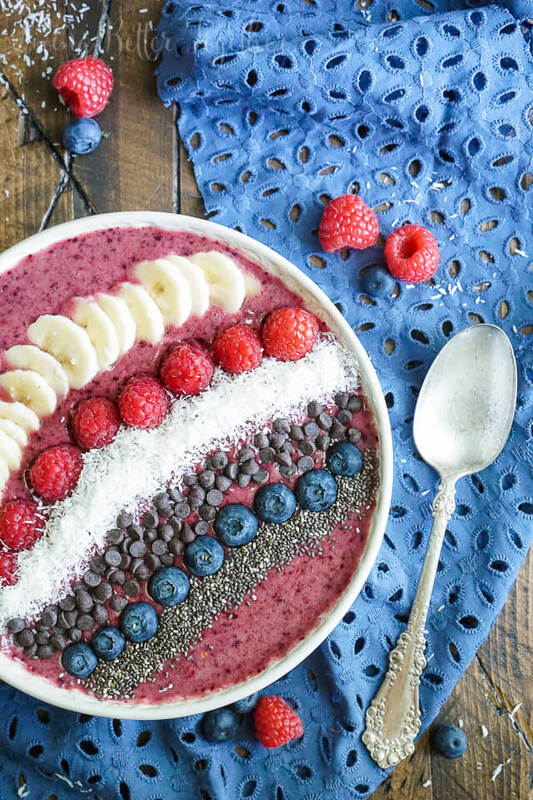 I’ve never made a smoothie bowl before, but this is gorgeous and looks delicious too. Can’t wait to try! Ps thanks for joining the giveaway with me! You gotta get on that ASAP, girl! They are so good! Thanks so much for having me! Looks great. I need to start my day off like that more often! I’d definitely make the Smoothie Bowl first, it’s such an inventive recipe how could I not make that the very first thing I’d make in the BlendTec. 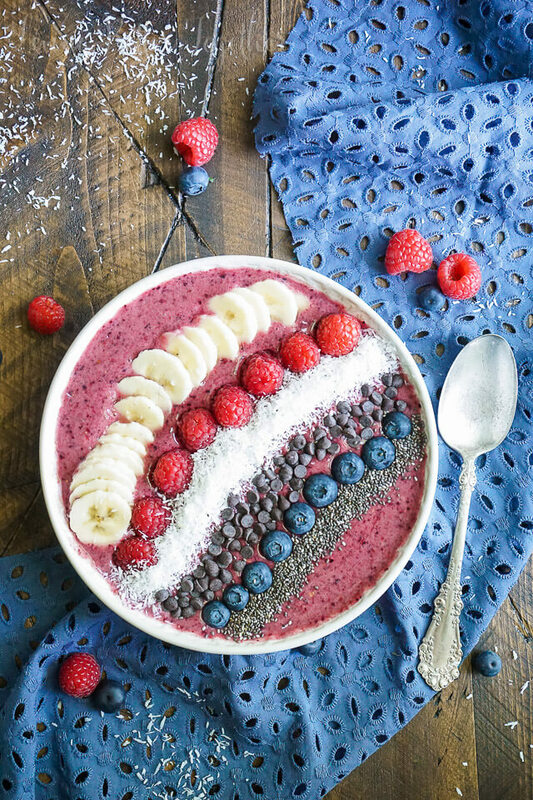 I would love to make this Smoothie Bowl! We make smoothies for breakfast all the time; this is such a great twist on that idea! My Blendtec just died and I use it all the time! I would love to win a new one! I would make a mango smoothie! I would love this for breakfast! It looks so vibrant and colorful. I absolutely adore food in a bowl and am impressed by the way you arrange the bowl. Your photos are beautiful, too…. Awesome recipe, love it! I would love to make strawberry banana smoothies – my favorite! I love smoothies, it’s the perfect way to start a morning. I’ve seen and heard of smoothie bowls before but never actually made one. This has got to change, because not only are they beautiful, it’s a smoothie in a bowl! 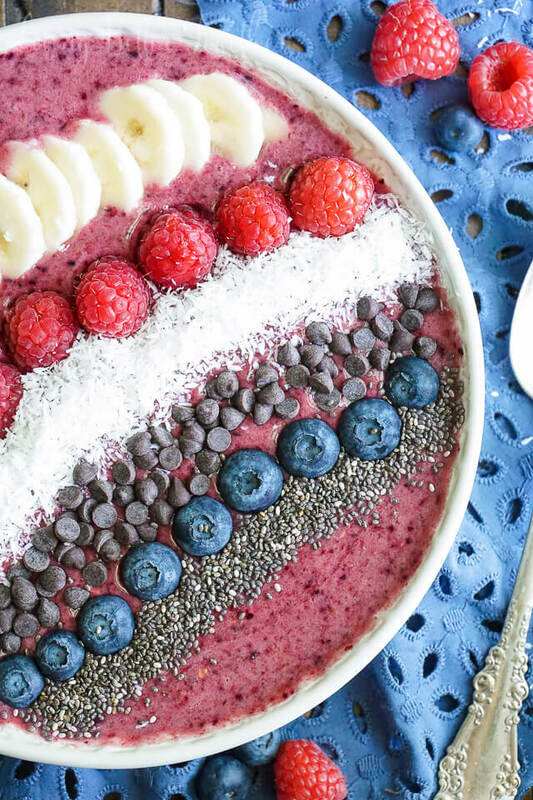 The smoothie bowl looks so good! this looks fantastic…and i think my 15 year old son would even eat it. Will give it whirl (get it!!) this morning. Stopping by from #HomeMattersParty.